He could have been a professional drummer, but chose economics instead. He could have wound up in London and worked only for himself, but he wanted to create more and also lead others. Johan Torgeby has always had his sights set on one profession, and in fact also on one bank. 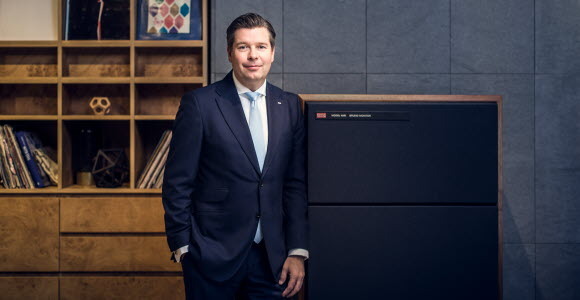 Johan Torgeby joined SEB in Stockholm in 2008 after spending a few years with Morgan Stanley, among other things as head of Financial Sponsors Group Private Equity in London. So his choice was actually not that hard. Johan Torgeby’s youth, however, was far from the world of banking, attending traditional eel parties (Ålegillen) and roaming the vast sandy beaches in Kristianstad and Åhus on Sweden’s southeast coast in Skåne, where his dad was a pastor and his mother worked as a midwife. But music was relegated to a recreational interest, despite the fact that he was accepted into the prestigious music high school in Malmö. After instead choosing to major in economics, he acquired an even keener interest in national economics at the university in Lund. Continuing in the academic world was one option, but a job offer from Robur pushed his career development in another direction. Johan Torgeby is a self-described leader who thinks it is important to foster an open and discussion-friendly climate. He believes in building teams and thinks working should be fun, “even though it can’t be hullabaloo every day.” And he is also aware of his weaknesses. What is it about leadership that attracts you? Do you have high demands? On yourself and on others? Johan Torgeby has served on SEB’s Group Executive Committee since 2014 and has played an instrumental role in drafting the Bank’s long-term strategy based on the challenges and opportunities that await going forward. In previous interviews he has said that he does not intend to make any major changes, but wants to follow the vision charted out by the Bank for 2025. Looking a few years into the future, what are the Bank’s biggest challenges? “The traditional business model for banks is currently undergoing a transformation. Owing to digitalisation, much is being done differently, and on top of this, a new regulatory landscape is driving a number of changes. Johan Torgeby identifies two main areas in which efforts need to be made to meet these challenges. These are digitalisation and advisory services, which each on their own must be world-class in addition to working in a close concert with each other. Where will the Bank stand in ten years?